NASPA New Otani offers a wide selection of guest room types to suit your needs. 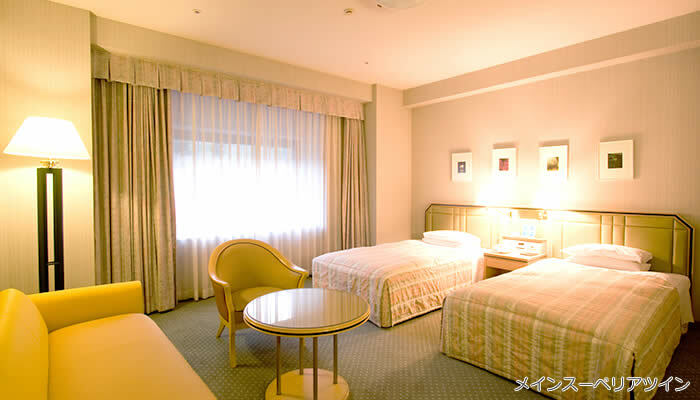 Western style rooms featuring large beds; Japanese style rooms featuring tatami mats and futon; and some rooms that mix both Japanese and Western styles, along with larger suite rooms. Find out more about each room type below. There are a number of 'No Smoking' rooms in the hotel. Due to the limited number of non-smoking rooms, there may be cases when we are not able to assign a non-smoking room on request. In that case a special deodorizer will be used to eliminate the odour. If you would like to confirm non-smoking rooms in advance, we recommend our Airweave mattress rooms. All of the rooms fitted with Airweave mattresses are non-smoking rooms on non-smoking floors. Please also note that smoking and non-smoking rooms are generally on different floors of the hotel. Smoking is not allowed within the hotel apart from in some specified 'Smoking Areas' that are clearly signed. Slippers and yukata gowns are provided in each room and can be worm within the hotel (except from Restaurant FONTANA and Bar CAPRI. All of the guest rooms at NASPA New Otani have private baths and showers. Many guests enjoy bathing in our public onsen hot spring baths - we recommend you try them out too! All of the guest rooms at NASPA New Otani feature at least one Western-style toilet. Safe boxes are available in every guest room and at the Front Desk. Free Wi-Fi is available in all Guest Rooms at NASPA New Otani. A username or password is not required. Free Wi-Fi is also available in the Lobby of the hotel. Some rooms also have a LAN cable connection. If a LAN connection is required, please request in advance. An ice machine is available on each floor of The Main building and on the even floors of the Garden Tower building. A laundry room is available with coin operated laundry and drying machines. Vending machines selling a selection of soft drinks and alcohol drinks are available on each floor of the The Main building (every other floor in Garden Tower). Cigarette vending machines are available on the Lobby Floor and 2nd Floor of the The Main building.